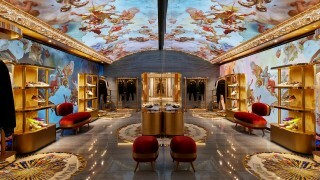 The splendour of the Eternal City, with the grandeur of its monuments, the poetry of its ruins, and the charm of its timeless history lives again in the majestic spaces of the 16th-century Roman palazzo that houses the new Dolce&Gabbana boutique. 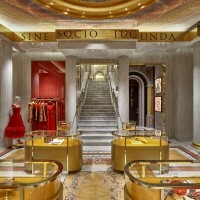 Overlooking Piazza di Spagna, just a stone’s throw from the Spanish Steps, the store is distributed over two floors and is designed for a city synonymous with magnificence and uniqueness. A veritable explosion of different varieties of marble from all over the world cover the floors, walls, and ceilings. From deep yellow, Marquina black and Siena brocade to red marble with ivory, cream, white, even iridescent veining, the range and combination of colours create never-ending chromatic poetry. Along the entire upper perimeter of the walls of the ground floor are Latin inscriptions, inlaid in gold mosaics, taken from the poems and letters of famous writers: a tribute to a city that was a crucible of great thinkers, each leaving an unforgettable mark on the history of literature. 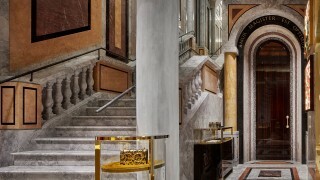 A monumental marble staircase leads to the first floor of the boutique, after passing through a gallery designed to feel like a sensory experience of what Paradise might be. Here history, tradition, and technology find their harmonious fulfilment in the form of monitors, installed on one of the two walls of the gallery and on the semi-vaulted ceiling, projecting a moving sky inhabited by heavenly angels, who, thanks to a mirror, replicate themselves onto the opposite side of the wall, creating a complete vault. The boutique was designed in collaboration with the architect Eric Carlson of the Carbondale studio, with the aim of exploring the magic of Italian craftsmanship. Come and discover the Ready to Wear, Accessories, Fine Jewellery and Watches Collections for Men and Women.